Its been said that "Gentlemen don’t go to windward"
Well they do if they are hoping to get to the "Caribbean Windward Islands". I think the idea is that gentlemen can wait a day or two for more favourable winds and hence avoid the need to beat to windward. This strategy actually does work in many temperate climates where winds come from a variety of directions. But here in the tropics the winds are much more predictable and come almost always from the east. Days and days of east winds, generally varying from 12-15 knots to 15-20 knots, and slightly ENE in the winter and E-ESE in the summer. 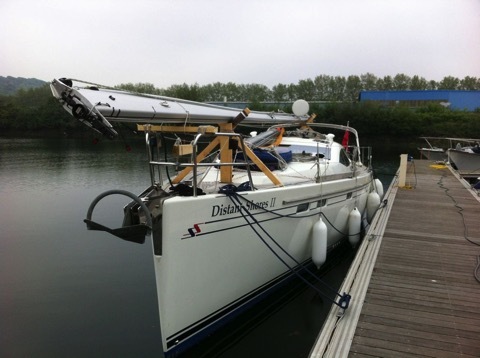 So the gentleman who hopes to sail from Saint Martin to Martinique will be quite close-hauled for most of the journey. 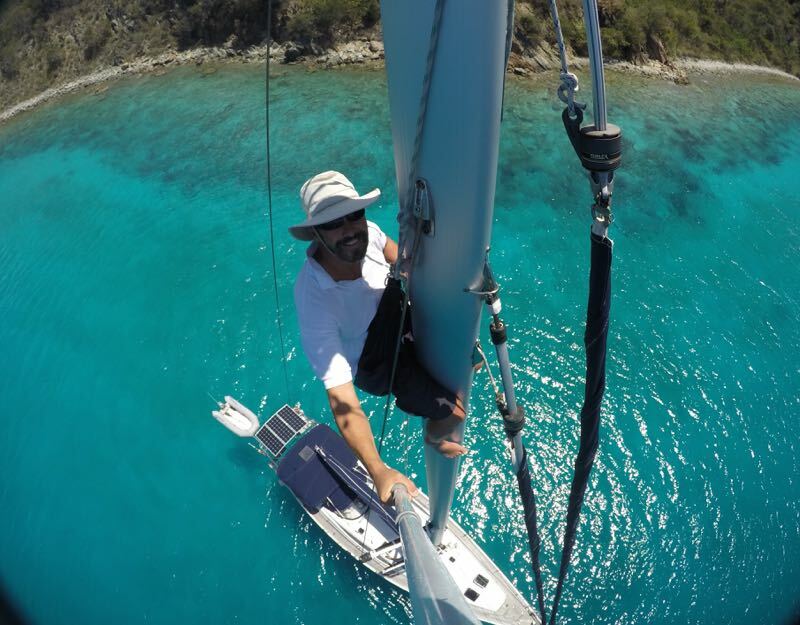 We just finished the upwind journey from Saint Martin to Martinique over the past 3 weeks. 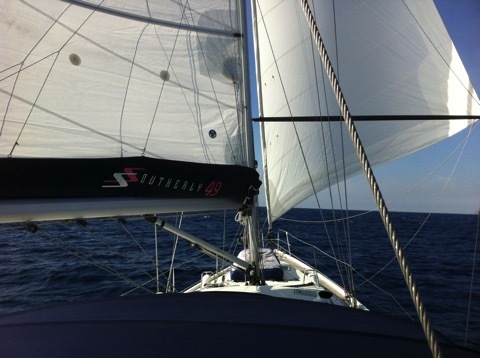 "St Martin to Nevis (63 nm) - great sail close hauled! Average 6.8 knots." 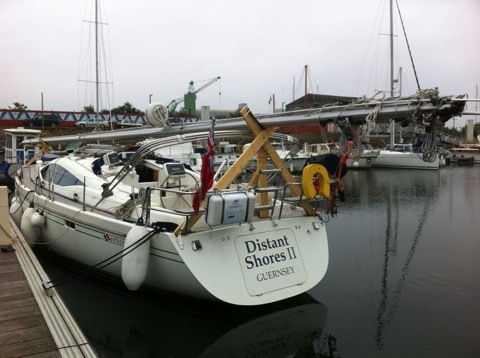 "70 miles Nevis to Deshais, Guadeloupe (70 nm) - we do this 2.5 hours less than a nearby 44 foot sailboat !" 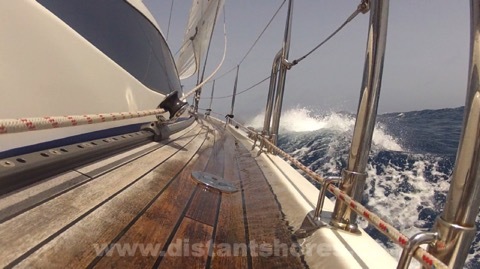 "Sail upwind Deshaies to Portsmouth, Dominica (45 nm) - 6.5-7 knots at 45% apparent in 18-24 apparent wind 1.5-2 meter swell"
"Upwind Dominica to St Pierre, Martinique (49 nm) - 6.3 knots - seas 2-2.5 meters, apparent winds 24-30 knots"
Our sails are just 3 years old and in excellent shape. 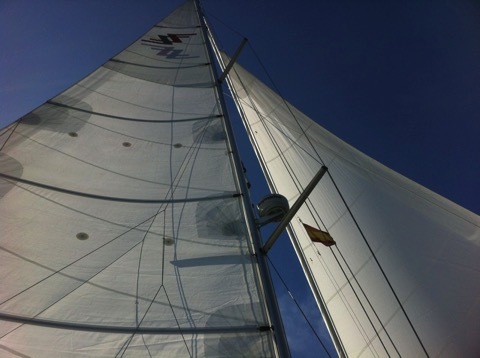 Old baggy sails can’t point efficiently to windward and will slow you down considerably. 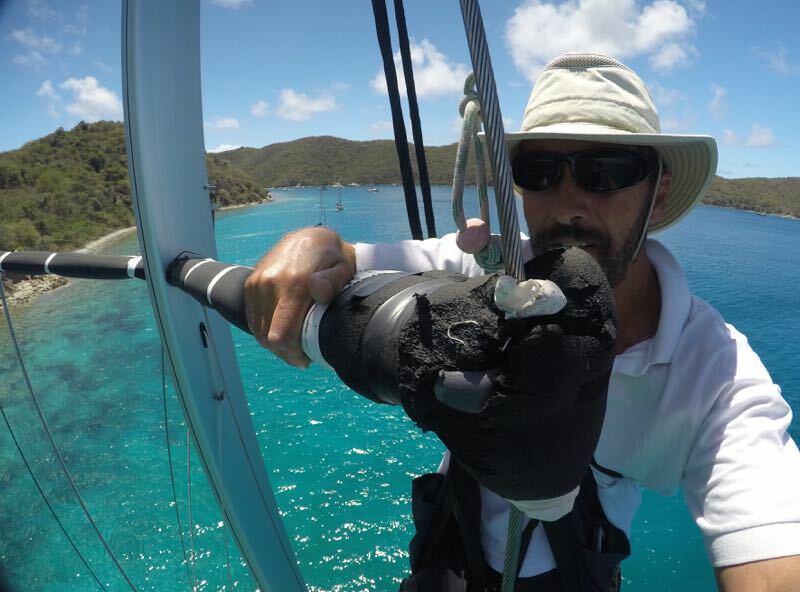 We were using our mainsail with one reef in it. 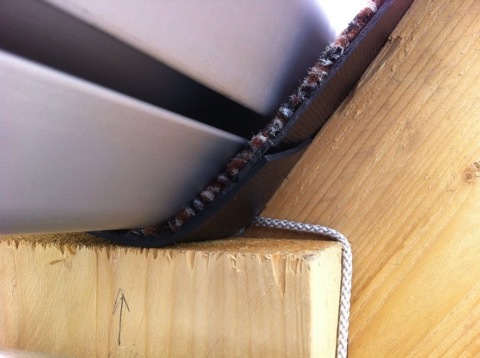 The fully-battened mainsail in good shape will almost certainly beat a furling mainsail when close hauled. 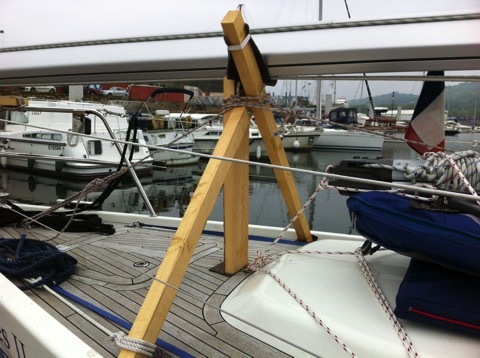 We have a "self-tacking" jib just 100% and quite flat cut. 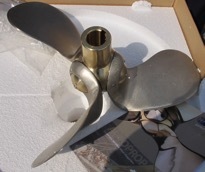 It is an excellent sail and in good shape. It is just Dacron however - nothing exotic. 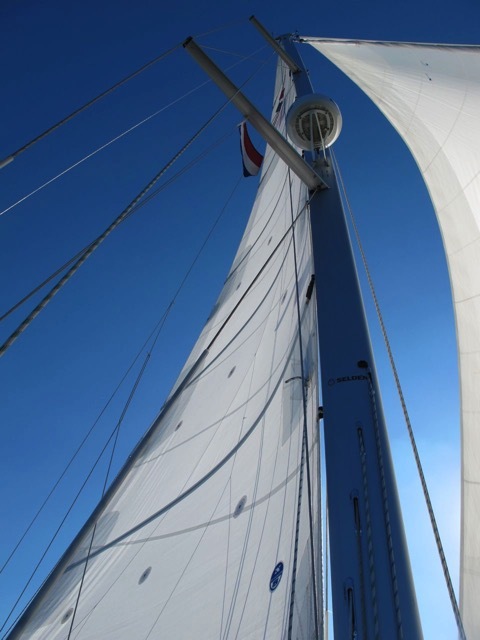 So if you have more modern sails you might go better to windward, if you have older sails or are using a bigger genoa reefed down then you will have more difficulty pointing. 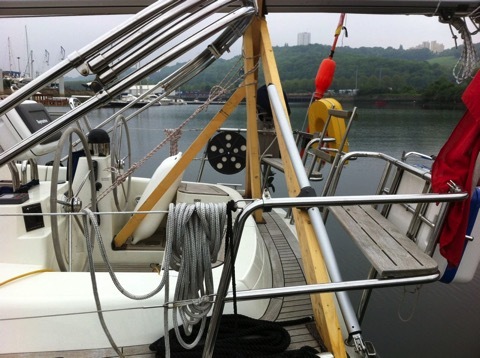 Comparing our previous boats, our old Classic-37 "Two-Step" had a sailing waterline length of less than 30 feet. Distant Shores II has a waterline of almost 48 feet as she sails to windward. This means she pitches much less, absorbs the waves more easily and is drier as well. Not much you can do about this one, but be aware if passage planning that a smaller boat will have a rougher ride, especially to windward. I know that as we sailed these past 2 weeks we were enjoying the sail and sitting in the mostly-dry cockpit. Remembering Two-Step, as I looked at some of the larger waves coming at us I thought how much wetter and less comfortable we would have been on Two-Step. 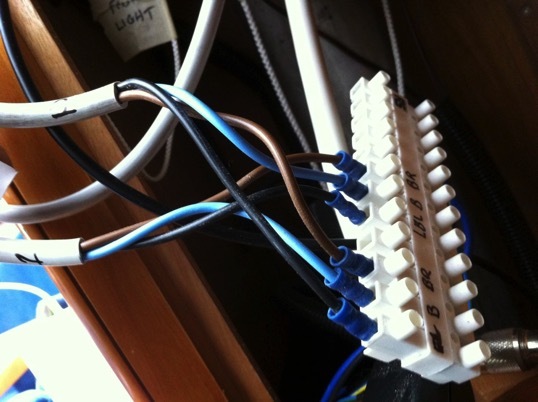 The extra waterline length also means higher speed. As we averaged nearly 7 knots on the first 3 days we cut a couple hours off boats that were struggling to make 5.5-6 knots upwind. 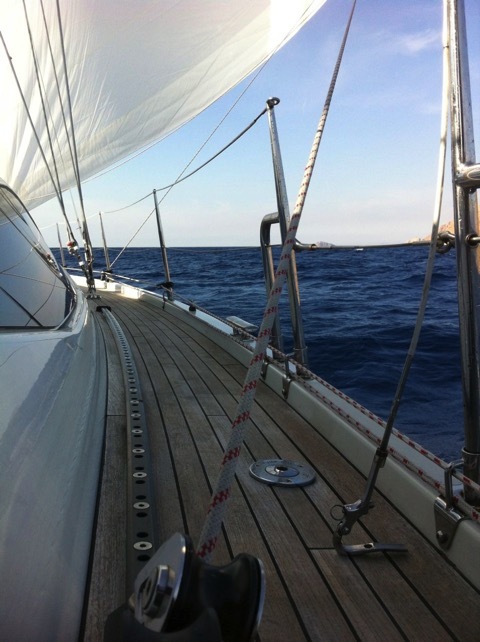 Its 71 miles between Nevis and Guadeloupe and we took 11 hours (average 6.5 knots). 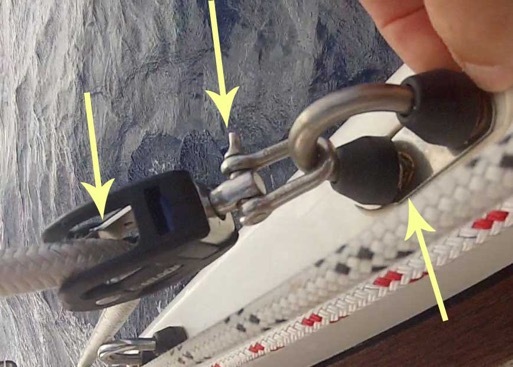 For boats that averaged just 1 knot less that would take 2 hours longer. That meant we didn’t have to get going in the dark, still making it in before dusk at the lovely harbour of Deshaies. The last log entry is for the crossing from Dominica to Martinique. Seas were higher at 2-2.5 meters (7-8 feet), the wind was up with a forecast of 20-24. We certainly saw those seas and higher in the turbulent zones near the headlands. Apparent wind was 24-30. In these conditions I decided to just fly our tough 100% jib. 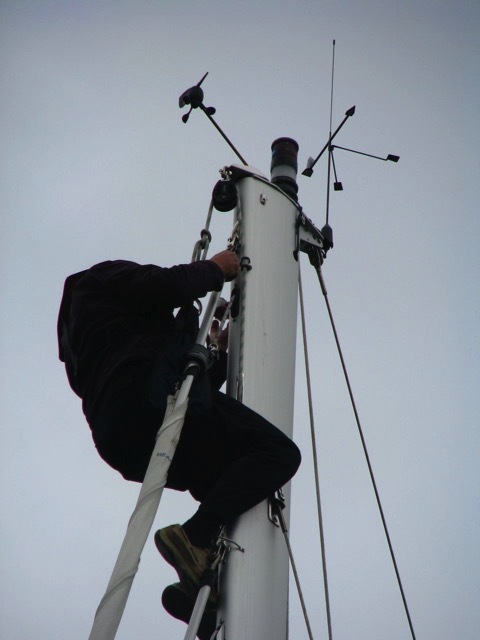 We could have flown a double reefed main as well but I was worried about higher gusts near the high headlands. So we took it easier and slowed down a bit. 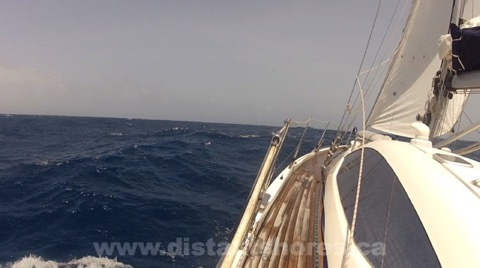 As we passed the gusty headland leaving Dominica we had a few rolls in the jib to reef even further. With just the jib we stood up nicely and still sailed at a reasonable 6-6.5 knots. 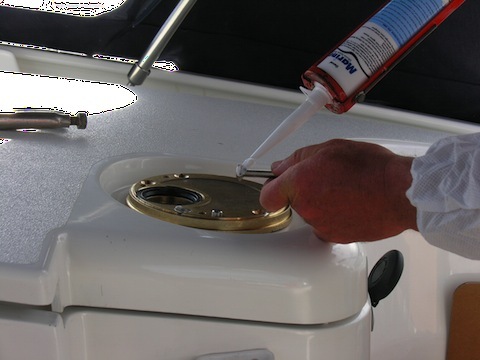 So knowing the limits for your sail configurations, and how comfortable you can be in bigger seas is a factor too. As we were closer to our "comfort-limit" on that last sail I wanted to take it easy on the boat and her crew. After all we were completing the last leg on our journey to the "windward islands" so hopefully can crack sheets and enjoy some reaching coming up!! I have often wondered about adding an electric winch. 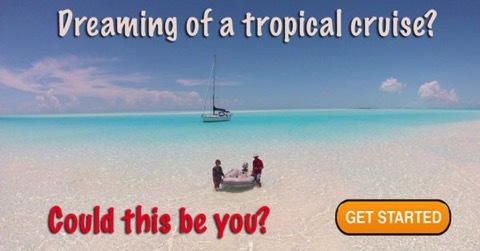 As boats get bigger, as we get a bit older, or just lazier, it might seem like a good idea. I also wonder if there are times I might not bother raising the main for just a shorter sail and just putting the jib out because its easy! 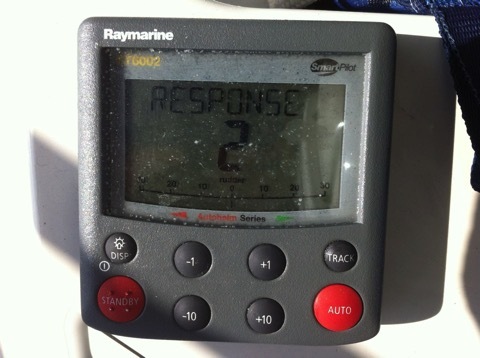 I guess that means I am lazier ;-) Anyway with the new 49 footer it was time to think about the question again. Raising the main on the 49 is just that much more work than the 42. 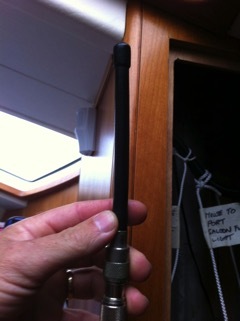 With the 42 I could raise the sail to within 3 feet of the masthead and just winch it the last bit. The job is a tough one first thing in the morning (and honestly a bit much for Sheryl I think). 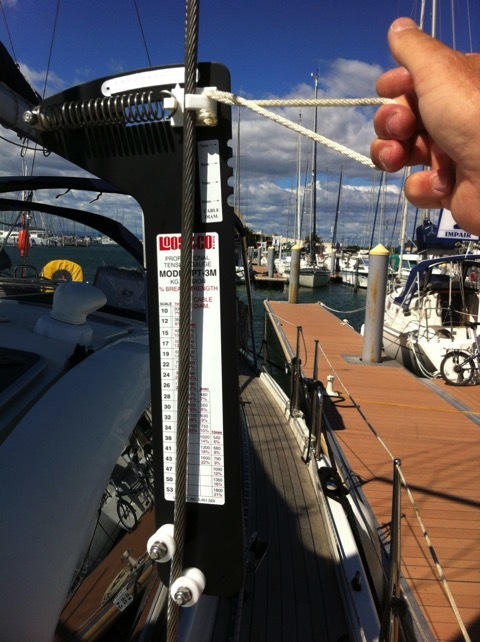 When we were spec’ing out the 49 I wondered if we would need an electric halyard winch but decided to wait and see. 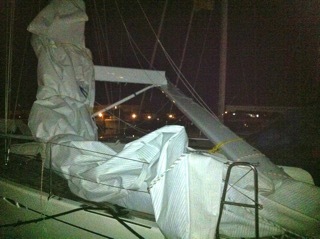 The sail is 33% larger than the one on our 42 and I would guess roughly that much heavier. 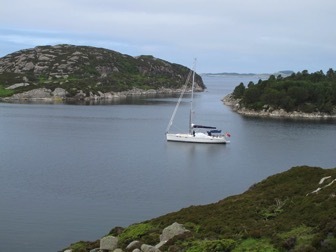 Now that we have had the boat for a few months and sailed her in a variety of conditions we have found out just how much difference there is between the two. 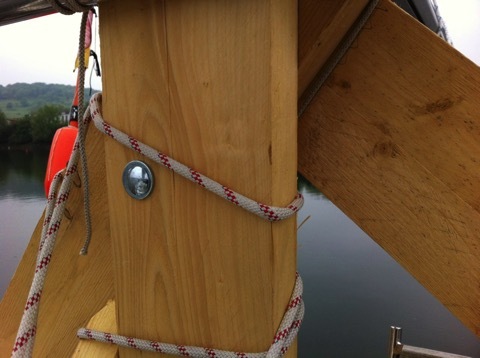 Without the winch I can pull the sail up just above the upper spreaders. That is a tough pull then there is still almost 20 feet left to winch. 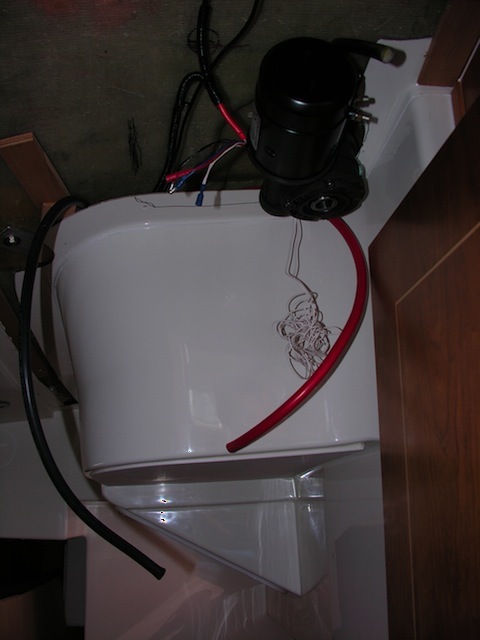 So it was definitely time to go for an electric halyard winch. 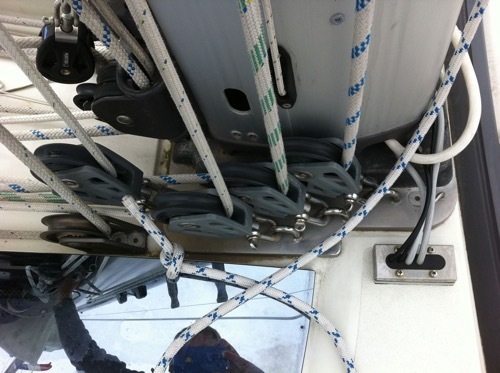 In this case the installation was much simpler since we were converting the existing Lewmar winch to power. All Lewmar winches sold in the last number of years are easily convertible using a standard conversion kit. 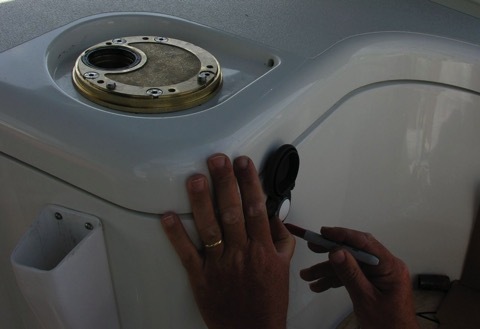 So we would be using the same winch and just adding a new base plate, and motor assembly belowdecks. 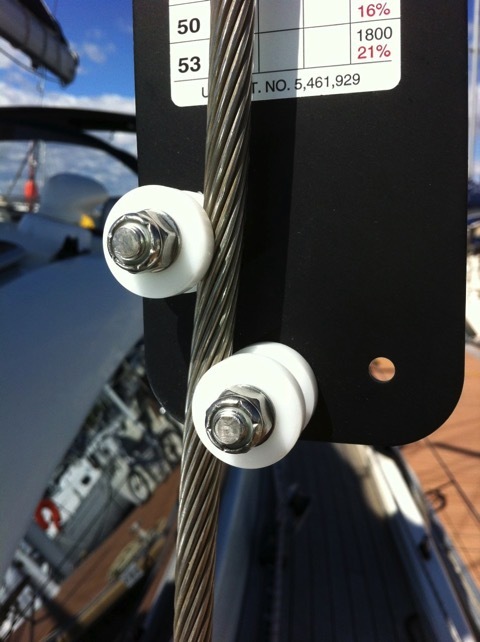 Electric winches use a lot of power so we used very heavy wire - 70mm2 or double-0 AWG. 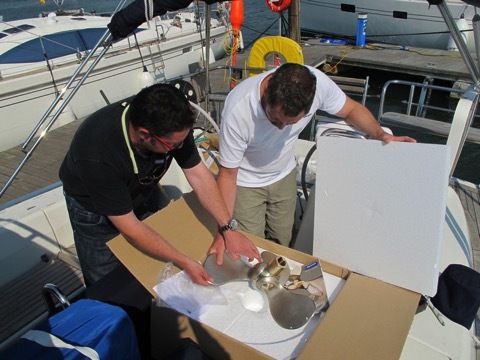 In our case I was converting the halyard winch which is on the cabin top so we had to carefully consider where the motor would intrude the least into the cabin. The winch itself will have a new base plate and a gear shaft that allows the motor below to drive the winch. 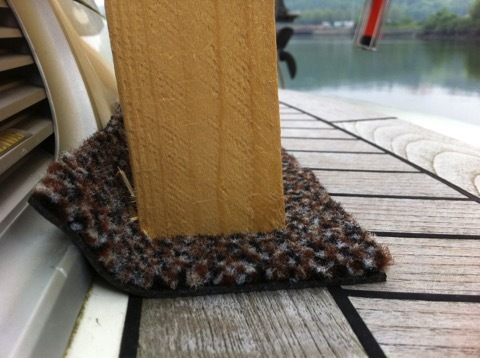 This requires a new large hole drilled in the deck. 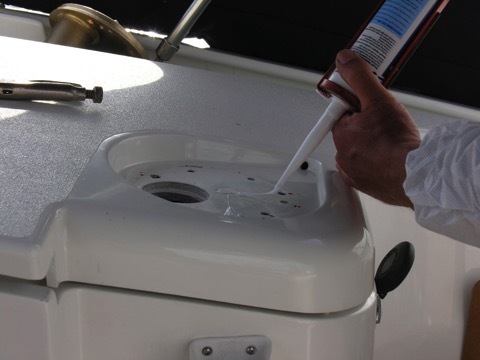 Always fun drilling a big hole in your new boat!! After final fitting the new base plate is set down with silicone. I mounted the switch under the winch checking so we could see the main while pushing the button. 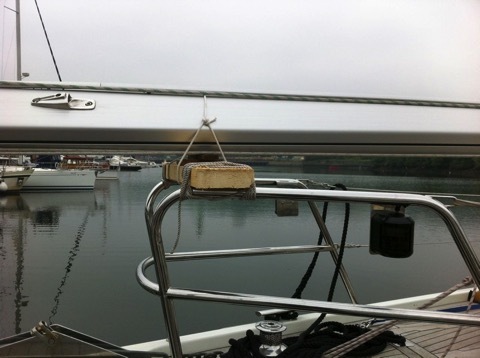 Our first outing with the new winch was for our 30 mile sail down the English Channel to Brighton. A mid afternoon departure was dictated by the tides so 1500 hours saw us heading into the wind in the Solent. Raising the main was a dream! What a pleasure to just push the button and watch the sail go up. On to Brighton, then Ramsgate, then across to Holland! 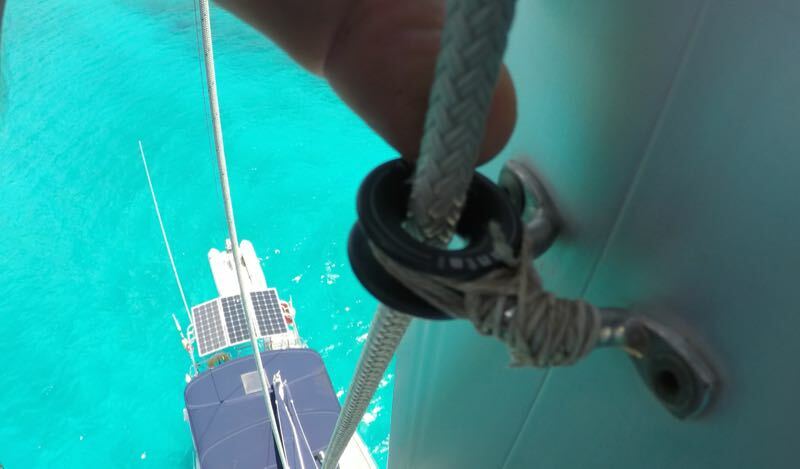 One useful technique we have seen on other boats is to use the halyard winch for other jobs as well. In our case we can also lead other lines to the electric winch. 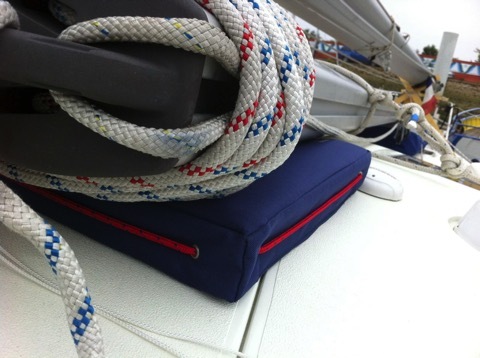 Our two forward furled sails also require a good healthy pull. They can be winched by the aft cockpit winches but it is a long chore in heavy wind. 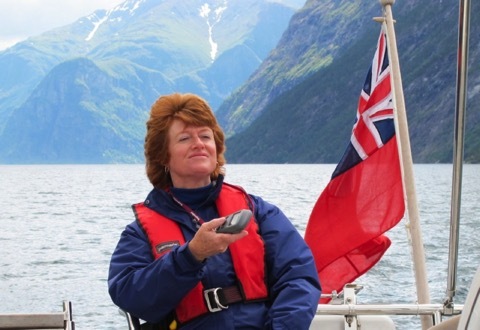 Now I can lead the furling line with just one turn around the cockpit winch then up to the electric winch. What a great advantage!! One electric winch doing quite a few of the heaviest winching jobs. It was certainly a conversion well worth doing.